Police have warmed they will not tolerate abuse after two shocking incidents in Nelson and Brierfield saw officers surrounded by angry groups of youths. Several incidents have taken place in the area in recent days, culminating in stones being thrown at officers following a serious car accident in Colne Road last night. Another incident in Clegg Street, in which a large group of men surrounded and intimidated officers prompted police to issue a warning that any further anti-social behaviour would be prosecuted. Officers patrolling these areas will now be equipped with body cameras, usually reserved for patrols in large towns and cities, in a bid to catch the culprits. Lancashire County Coun. Azhar Ali, who represents the Nelson East ward, called for residents to respect the police who, he said, should adopt a zero tolerance approach to anti-social behaviour. He said: "Anti-social behaviour in any form is unacceptable, but when youths try to obstruct police from doing their duty then that is completely unacceptable. "I would back the police to take a zero tolerance approach to this. If a curfew has to be enforced in the evening then I would support that. 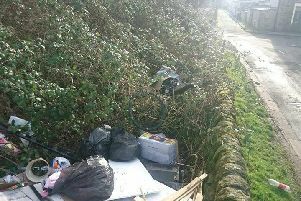 The police, as well as the vast majority of the residents of Nelson and Brierfield, do not want to be put out by these yobs. "With it being Ramadan at the moment a number of people are making trips to the mosque late in the evening but that should not mean we should be having trouble on the streets. "The rule of law is sacrosanct and should be respected." A police spokesman said: "In recent weeks police have unfortunately witnessed large groups of men surrounding them and presenting high levels of abuse, as well as stone throwing and swearing at police whenever they are conducting police business in the Nelson and Brierfield areas. "Last night such an incident occurred after officers had to close Colne Road due to a serious road traffic incident. The actions by this group as well as being annoying and distracting potentially puts lives at risk, and is totally unacceptable and criminal behaviour. It is a criminal offence to obstruct any police officer during the execution of their duty and can result in arrest and a criminal conviction. "Yesterday another incident occurred on Clegg Street, when four men in a car, none of whom were wearing seat belts, were given words of advice by police, a discrepancy action on behalf of the officer who could easily have issued them all with a fine. "However, during this incident one 28 year-old male thought he could threaten, swear at and abuse the officer whilst doing his duty. With the assistance of a large group of other men in the area surrounding the police, shouting at them and interfering in this incident, the man managed to get away. "Every single person who was involved in that incident is guilty of obstruction and assisting an offender. The 28 year-old, also from Clegg Street, has now been dealt with by a £90 fine for Section 5 Public Order and if he behaves in this manner again then an arrest, charge, court appearance and a risk of a criminal conviction will follow. "Police have the full support of schools, mosques, action groups, local leaders, local councillors and every decent member of the public, and as such we will identify and deal with anyone conducting themselves in this way in future."